B&N performed an in-depth condition inspection of the historic Latah Creek Bridge (also known as the Sunset or High Bridge) located in Spokane, Washington. This cast-in-place reinforced structure consists of seven arch spans and multiple approach spans. It was built in 1911 and is 1,070 feet long. The inspection was conducted as part of a comprehensive rehabilitation study of the structure to characterize the condition of the bridge. The bridge owner, the City of Spokane, wanted to determine the economic and technical feasibility of restoring, rehabilitating and/or modifying the existing structure. CH2M Hill used the inspection data B&N provided to help determine the scope of restoration and rehabilitation required. In-depth inspections were completed on one span and one pier. A cursory visual inspection of the remaining portions of the bridge was used to generally compare conditions to those found during the detailed inspection of the span. Material sampling and corrosion testing supplemented the visual inspection findings. Superstructure members were investigated for material deterioration, weathering and aging effects, load-induced distress, and other factors. 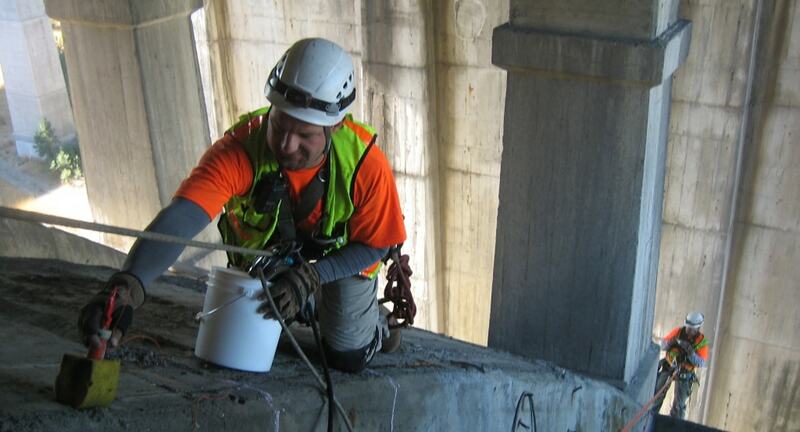 A variety of methods were used to inspect the bridge including adapted rock climbing/industrial rope access techniques, rappelling and an under bridge inspection truck.